You see that guy… You know why he is smiling? Not only does he live on the gorgeous Italian Riviera, but he is about to create one of the most delicious street foods of all time. Before my trip to Italy, I had strict instructions from my well-traveled friends to try Ligurian pesto, seafood, and focaccia. Why didn’t anyone mention farinata? I’ve never even heard of it before going to Liguria. When we walked into the first pizza shop in Vernazza on our hike through Cinque-Terre, we were literally moonstruck by a huge yellow pancake! Its crispy edges were begging to be eaten, but I didn’t know if we can handle eating this whole moon – it was 2 feet in diameter! Lucky for us, another lady walked into a shop and asked for “farinata.” Swoosh! A half circle was cut off the moon’s edge and handed to her. Aha, we could just get a piece of the moon! I followed in her footsteps and asked for farinata too. Swoosh! And I got my piece. It was crispy on one side and delicate on the other, thicker than a crepe, but thinner than a pancake, very simple, yet absolutely heavenly. As soon as I swallowed my first bite, my reverse engineering brain set to work. It was definitely not wheat. Maybe corn – it had that golden color, but the texture was much finer, not as gritty. I’ve never had anything quite like it. I don’t think astronomers get as excited about discovery of new stars, as I get excited about discovery of new pancakes. I was not too worried about never tasting farinata again, until I got back to the US and couldn’t find it in Marcella Hazan cookbook. I count on Marcella for all my Italian cooking needs – fresh pasta, grilled whole fish, pork braised in milk. How could she omit such a delicious part of Ligurian cuisine! I searched all my reliable web recipe sources. Nothing. After googling for “farinata” I found out that it was made out of chickpea flour (not corn! ), but still no recipe. “I guess I’ll have to go back to Liguria someday,” I thought. Imagine my surprise when I was reading chowhound home cooking board more than a year after my trip, and saw a post from Nick with Mark Bittman’s recipe for farinata. After a quick stop at the Whole Foods for chickpea flour, I was on my way to recreating the dish I missed all year. It was just as good as in Liguria – crispy, delicate, and absolutely addictive. 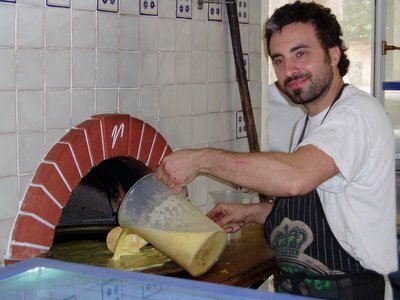 But even though I can now make farinata, I’ll still have to go back to Liguria someday. I used Bittman’s recipe almost as is, but instead of pouring all the batter into the skillet at once, I baked it in batches to make several thinner pancakes rather than one thick one. Whisk chickpea flour, salt, and water until no lumps remain. Whisk in 2 Tbsp olive oil. Cover and set aside at room temperature overnight. Put a well-seasoned cast iron (or non-stick) skillet in the oven to warm up for 5 minutes. Add a little olive oil to the skillet and return to the oven for 2 more minutes. I use about 2 tsp oil for a 10 inch skillet (adjust this amount if your skillet is of a different size). Whisk the batter well before using. Pour in enough batter to cover the bottom of the skillet and form 3mm thick layer (about 3 times the thickness of a crepe). The batter will sizzle. Place the pan in the oven, and cook until the pancake is dry on top and solid in the center when you nick it with a knife, about 12 minutes. Carefully remove farinata to a plate, add more oil to the pan and repeat with the rest of the batter. Serve as soon as farinata is out of the pan, or put on a cookie sheet in one layer and warm up in the oven after you finish the batter. Cut into wedges and serve as a snack. 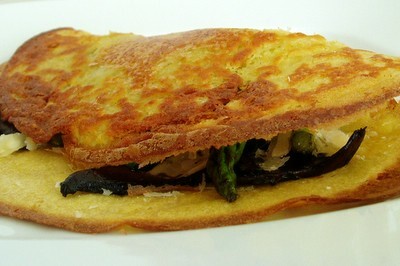 Or fill with all kinds of savory goodies like a crêpe. I don’t know if filling it with stuff is authentic, but it was certainly yummy. You could have asked me! There are so many wonderful regional dishes that never get known outside Italy and it is really a pity! So could you eat it with a little cheese or some pesto? It sounds great but maybe a little lonely all by itself? Or maybe that's the point? I'll have to try it! Sounds very interesting. I've never heard of this. Ah, the glorious memories of Italian food ... great post! You could put all kinds of stuff into it, but it is really yummy all by itself. It's just one of those dishes that adds up to more than the sum of its parts. When I had it in Liguria, it was just plain, and I couldn't get enough of it. But it is meant to be served like a snack, not the main course or something. When I wanted to turn it into something more substantial this weekend, I stuffed it with sauteed asparagus, portabella mushrooms, and parmesan. I've never heard of farinata either, but it looks straightforward enough... and delicious. Tried it first with 1 3/4 cup water as I thought the recipe said: discovered that the recipe meant one 3/4 cup of water--the second try worked out much better. You interpreted the recipe correctly. It's one cup plus 3/4 cup water (almost 2 cups). the batter should be very liquidy (like for crepes). If you use 3/4 cup water it will be quite stiff. That might be a really good dish too, but different from farinata. Helen-I just put some "farinata batter" to rest until tomorrow, I have found a variant to your excellent recipe! A type cooked with something on the top, if it's nice I'll make a post out of it! And link to you of course! Hi there, found your site through Amy at Not As Good As Pork Cracklins. Your post has intrigued me beyond belief and as luck would have it...today is my shopping day...just added chickpea flour to the list! I can't wait to try these! I love crepes and pancakes. Thanks! I do believe this is a gluten free recipe, which means I can make and eat it! Thank you for posting it. So yummy looking! A caller to a recent NPR food show reminisced about "Argentinian" pizza of her childhood. It was a thin crust chesse pizza, topped with a farinata pan-cake (cooked separatly) and sliced into wedges before service. Sounds delicious. I have just found Indian gram flour and am starting to experiment. I heated the pans on top of the stove, added olive oil, then the batter, and finally finished them on my gas grill outside. Good first course. I find a little extra water thins the batter nicely. Well, I am browsing for a recipe for poppadums/papads, which I know are made from 'gram flour'. Wikipedia says that the flour is made from Urad - which is a little black bean but when skinned is white and called Urad Dhal ... the word 'dhal', apparently, applying to any pulse that is skinned and split. We have a local Indian market (which doubles as our local Post Office) and I found gram flour there but it is made from channa dhal (chickpeas). I Google again (or actually, not Google but a search engine that pays me 2p for every search I do!) and I came across a reference to 'Farinata'. This sounds delicious and I am going to try it! In the mean time, all those who have managed to find chickpea/garbanzo flour, onion bhajis are made from this and so may be those deliciously crispy pappadums/papads. It sounds as though Italy and India are not so very far apart! If anyone can't find chickpea/garbanzo flour, by the way, you can take almost any bean, pea or lentil and cook in the recommended way until you can mash it (if you use canned beans, they are already cooked). The pounded and dried mash is the flour you need. If you forgo the drying, then add a little less water to the recipe to suit. This sounds like a plain version of an Indian breakfast dish we eat, called "besan ka poora" (or "cheela" in other regions). We mix chickpea flour, water, a little oil, and salt like in this recipe, but also add to the batter a little chopped onion, ginger, chili pepper, and cilantro. They are SO good. Maybe I'll try this out when I'm too lazy to chop up all the other ingredients. You can find farinata in Liguria will all sorts of toppings baked in. Some of my favorites are artichokes, salami, cippoline. Absolutely delicious, no matter how you make it!